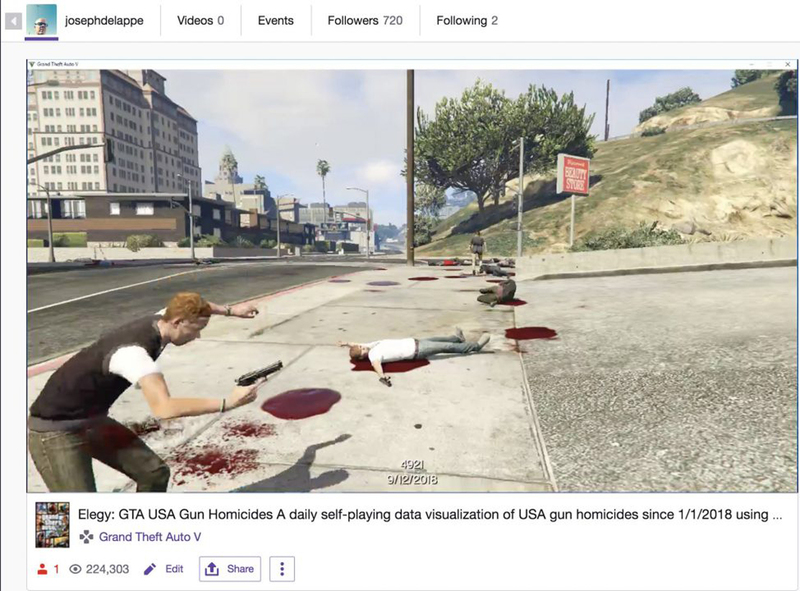 Elegy: GTA USA Gun Homicides is an online project live streaming a modded version of GTA as a self playing data visualization system. The project reenacts daily the total number of USA gun homicides since January 1st, 2018. The project works from a daily update of total 2018 gun homicides as scraped from the Gun Violence Archive online. Gun homicide totals since January 1st are revised daily on this website which are then fed directly into the project – starting at 0 each midnight, each day the new total body count since January 1st is reenacted in it’s totality and so on. Each night, at midnight central time, the project resets and starts anew. As of September 11th, 2018, there were 10,174 gun homicides in the United States – by the end of 2018 this number will likely reach close to 15,000. 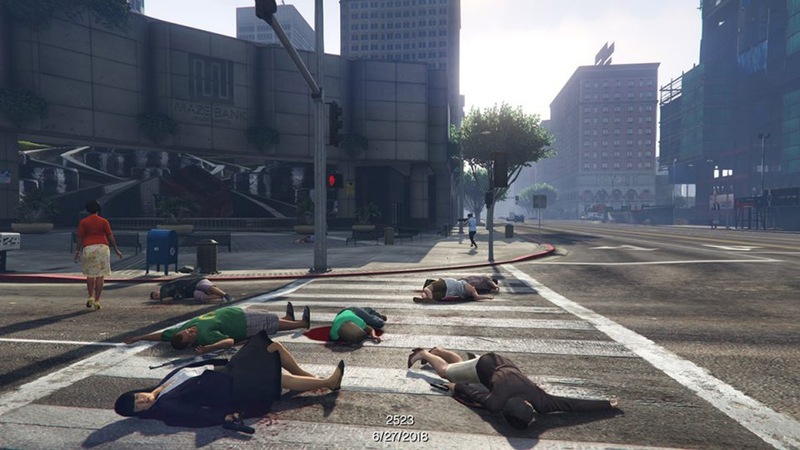 Elegy, a self-playing version of GTA reenacts these deaths as seen from a slow backward tracking shot meandering through the gamespace to record the action in real-time. The project is being live streamed on Twitch.tv. The work is accompanied by a looping soundtrack, of the first radio recording of “God Bless America” as sung by Kate Smith in 1938. 2018 is the 100th anniversary of the composing of this song by Irving Berlin. The work is a pilot project to explore data visualization using computer gaming. The intention is to run the project 24/7 for the next year until July 4th, 2019. Elegy: GTA USA Gun Homicides from ACM SIGGRAPH on Vimeo.